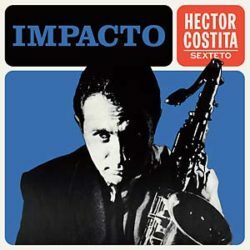 Vinilisssimo present a reissue of Hector Costita Sexteto’s Impacto, originally released in 1964. By the mid-1960s, samba and bossa nova were the exotic hip sounds of the time. João Gilberto had gained international popularity by blending American jazz and samba, and Sérgio Mendes was about to reach the Billboard Top 5 a few times. Hector “Costita” Bisignani had arrived to Brazil a few years earlier from his native Argentina, where he started to play saxophone influenced by local legend Lalo Schifrin. During his first years in Brazil he would play with artists such as João Donato, Manfredo Fest, and Sérgio Mendes (as part of Sexteto Bossa Rio), and also released a solo album: O Fabuloso Hector (1962). In 1964, Costita and his sextet recorded Impacto (Fermata) in São Paulo, an explosive mix of tough jazz and Brazilian samba in equal measure, widely considered his best work. The opening track “Le Roi” alone should be enough reason for any music lover to own this beautiful record, but the entire album is absolutely amazing. The work of Tom Jobin and Vinícius de Moraes has a prominent presence on the tracklist, which also features three compositions by Hector Costita: “Impacto”, “Tanganica”, and “Gabriela”. Horace Silver’s “The Tokyo Blues” is here simply listed as “Tokio”, but the performance of Costita and his sextet does not shorten any of the original brilliance of the tune, showing the strength of jazz peppered with samba and the undoubtful skills of the musicians… This album is killer. Hector Costita would later stop recording music for quite a few years, working as a sideman for many artists such as Elis Regina and Wilson Simonal and as a music teacher at CLAM, a Brazilian music school founded by Zimbo Trio. Thankfully he would return to the studio in 1981 to continue his brilliant solo career. Presented in facsimile artwork and pressed on 180 gram vinyl.